The first cruise ship built exclusively for sailing in Greenland, MS Fram was named after the polar ship built by Fridtjof Nansen, who explored Greenland in the late 1800s. The ship’s name, in fact, had to be approved by Oslo’s Fram Museum. Artists from Greenland were commissioned to create the ship’s original artwork, which complements MS Fram’s Nordic ambience. Interior design is characterized by extensive use of wool, leather, and oak. 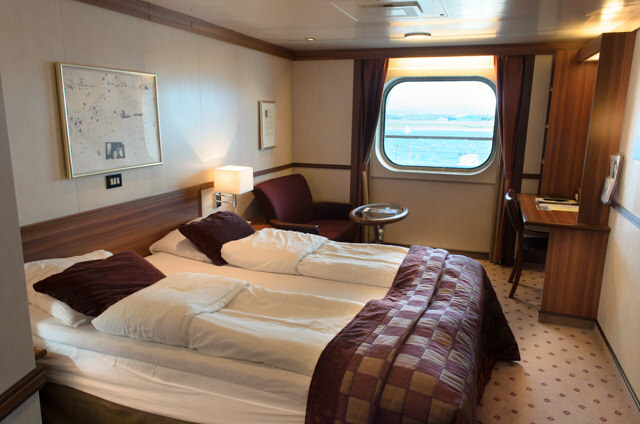 The ship’s glass-enclosed observation salon offers panoramic views of the scenic destinations. Other highlights include a wellness center with sauna, fitness room, two glass-enclosed outdoor whirlpools, a bistro, and ship’s library. One main dining room, the nonsmoking Restaurant Imaq, an Inuit word meaning “sea,” hosts three meals daily. 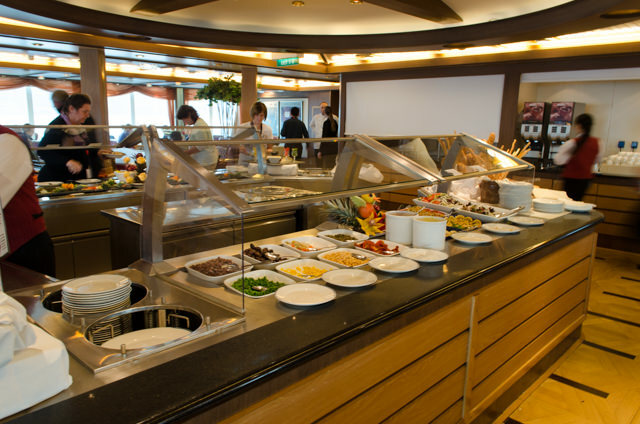 Breakfast and lunch, which feature the famous Norwegian “cold table,” are self-serve buffets, but the three-course dinner is served in two seatings. A separate dining area, The Bistro, offers snacks and drinks for purchase. Eight cabin grades are available. 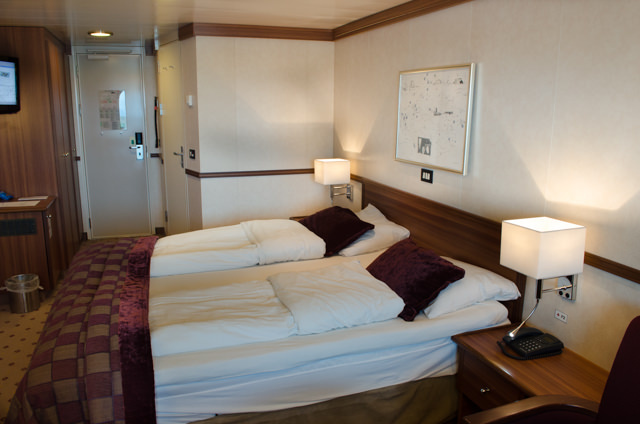 Fram features more suites and mini-suites than any other ship in Norwegian Coastal Voyage’s fleet. Suites include one grand suite, seven standard suites, and 31 mini-suites. All suites feature queen-size beds, minibars and sitting areas (the grand suite comprises two rooms), and some suites feature private balconies. Additionally, there are 95 standard cabins (24 inside), and two cabins for the physically challenged. All accommodations feature televisions and refrigerators. Suites from 183–420. Outside cabins from 118–140. Inside from 118–140. With its ice-hardened hull, MS Fram was specially built specifically for operations in Arctic waters. 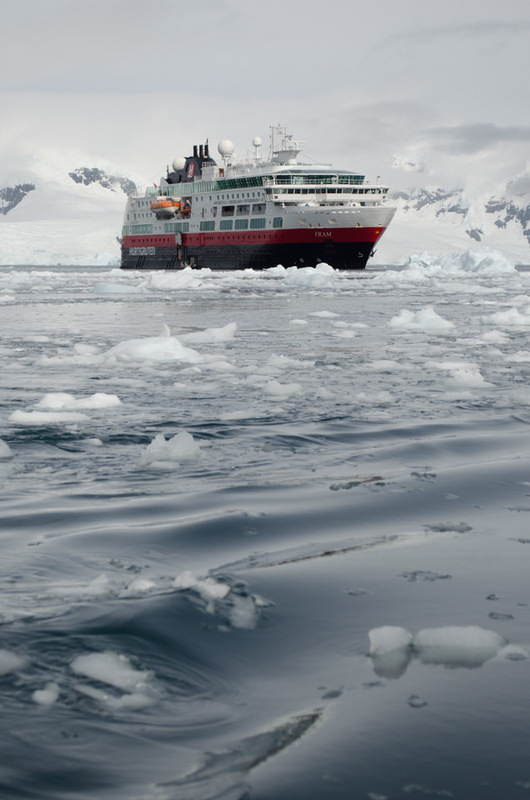 Hurtigruten is no stranger to the polar regions of this earth and the unique challenges they present. The Norwegian cruise company also knows how rewarding these voyages to the farthest reaches of the planet can be. Since 1893, the line has provided passenger and freight service between the Norwegian ports of Bergen and Kirkenes, all at a time when the 2,400-kilometer stretch of water was fraught with unpredictable weather and largely cut-off from the rest of the world. In modern times, the company also operated expedition voyages to Norway’s Arctic coast, including Svalbard, Iceland and Greenland. While the Northern Hemisphere enjoyed winter, one of its“coastal ships” was be sent to the beautiful and mysterious continent of Antarctica. But prior to 2007, Hurtigruten lacked a dedicated expedition ship that would be built to handle everything the stormy Drake Passage could throw at her. That would all change on March 1, 2006, when the first steel was cut at Italy’s Fincantieri shipyard for Hurtigruten’s first dedicated polar expedition vessel: Fram. This “new” Fram would be named after the 1893 ship of the same name that had carried Norwegian Polar explorer Roald Amundsen to victory over Robert Falcon Scott in his quest for the South Pole in 1910. Scott would perish on the ice during his return journey in March 1912 after finding the Norwegian flag already planted, and Amundsen himself would mysteriously disappear in 1928. Originally, Hurtigruten had intended to deploy Fram primarily on summer voyages to Greenland, while retaining the option to roll her back into the coastal fleet during the winter months. To that end, she was equipped with a small car deck capable of transporting up to 25 automobiles. When it became apparent that she’d spend her days cruising the polar regions of the world, the car deck was converted into a storage facility for the ship’s rugged Polarcirkel zodiac boats. Instantly, Fram had an unexpected advantage over her competitors: where most expedition ships are required to strap the rafts onto exposed deck space, Fram’s are kept warm and dry in the shelter of the Car Deck on Deck 2. Low, squat and blunt, Fram is the ideal ship to sail the notoriously stormy Drake Passage. She can cut through heavy seas with a surprising lack of effort, and barely shudders, creaks or rattles even in less than ideal conditions. The Fram is a hugely comfortable ship to be sailing the polar waters of the world on, and her interior décor has a lot to do with that. Her interiors pay homage to some of Norway’s most important explorers (portraits of Roald Amundsen and Fridtjof Nansen grace the two onboard elevators). Fram’s interiors also drew inspiration from the market she was always intended to sail: Greenland. All of Fram’s public areas are situated on decks 4 and 7, with Deck 4 acting as the primary entertainment deck. Here, as with all other Hurtigruten ships, the 174-seat Imaq Restaurant is located all the way aft and surrounded by three banks of windows to ensure the polar scenery is never far from sight. Providing breakfast, lunch and dinner, the room’s décor is some of the most traditional aboard Fram, with plenty of dark woods and brass accents complemented by rich red carpeting and soft furnishings. 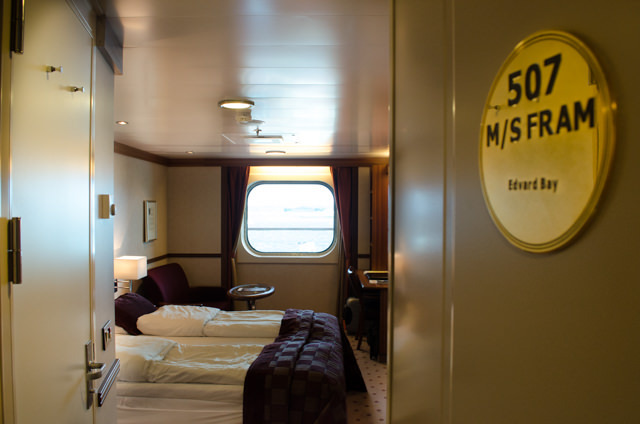 Deck 7 is home to the ship’s gymnasium and open aft deck with its two Jacuzzi tubs and plenty of open space for taking photographs or relaxing in a deck chair when the weather allows for it. Forward, the Observation Lounge offers sweeping 180-degree views of the scenery ahead, with windows that curve up attractively to form part of the ceiling. 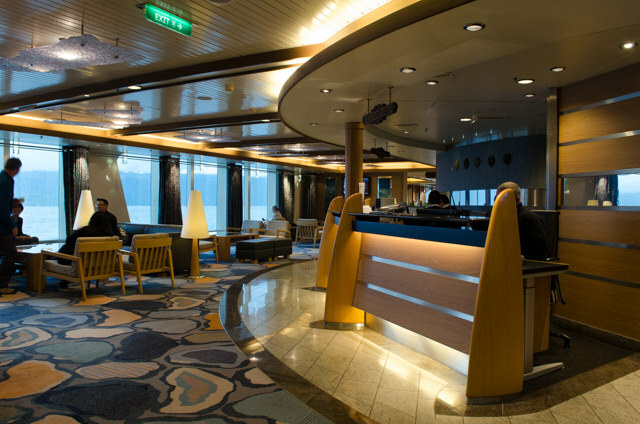 A full-service bar is situated at the end of the lounge, which functions as Fram’s only watering hole onboard. The company has taken a beautifully designed expedition ship that features all of the hallmarks and amenities that Hurtigruten has become known for on its Norwegian Coastal voyages, and paired it with an envy-inducing array of itineraries that explore some of the world’s most remote and moving polar regions. During the summer months of the Northern Hemisphere, Fram sails an intoxicating mixture of itineraries that explore the Polar Arctic. From so-called “Fire and Ice” voyages that circumnavigate Iceland to in-depth explorations of Greenland, these cruises are designed to be as inspiring as they are educational. The highlight of the summer season: Fram’s voyages through Spitsbergen, the largest island in Arctic Svalbard. It’s a wildlife lover’s paradise, with polar bears, arctic birds and Spitsbergen’s uniquely mountainous terrain. The undisputed crown jewel of Fram’s yearly voyage calendar, though, are her itineraries in Antarctica. While the exact ports of call in Antarctica vary depending on the weather and other environmental conditions, Hurtigruten offers a variety of voyages here, ranging in length from the classic 14-day “Frozen Land of the Penguins” cruise, which includes a pre-cruise hotel stay in Buenos Aires and embarks in Ushuaia; to the massive 20-day long “Ultimate Antarctica Experience” that also includes visits to the Falkland Islands, South Georgia (where explorer Ernest Shackleton is interred in the abandoned whaling town of Grytviken), and of course, plenty of time spent exploring the Antarctic Peninsula. A journey to Antarctica is as magical as it is indescribable. Penguins roam free, undisturbed by Fram’s blue-jacketed passengers as they walk by. Ice floes of unimaginable size drift past as the ship stealthily makes her way between landing sites. And at every turn, evidence of man’s long and romantic history with Antarctica is present, from abandoned whaling sites to landing sites and places of refuge utilised by the early pioneers of polar exploration. While people may still envision tropical islands and white sandy beaches when they picture a cruise vacation, Hurtigruten’s FRAM is there to take those looking for something more to the destinations they could never have imagined in the first place.